Thank you for the great visit yesterday! Please thank your nurse for me as well. She was professional and kind. I had an “ah ha” moment this morning that may benefit your other patients, as it did me. From Richard Rohr’s Daily Meditation for today, regarding our “lizard brain”. Full article here. Then this from Psychology Today. Full article here. [The Limbic Cortex] is the part of the brain that is phylogenetic ally very primitive. 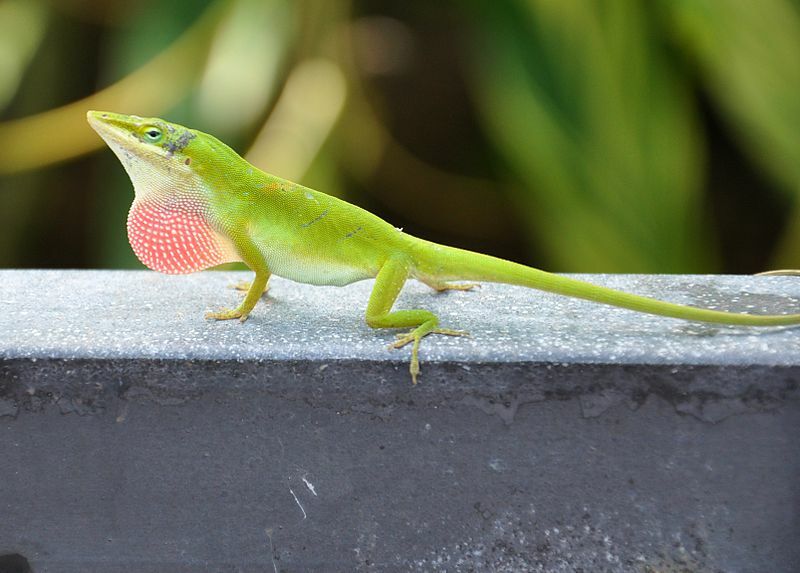 Many people call it “The Lizard Brain” because the limbic system is about all a lizard has for brain function. It is in charge of fight, flight, feeding, fear, and freezing-up... The point to all of this is that 12-step recovery recognized (before the limbic system was described) that we all have this tendency to do what we don’t want to do and we are powerless about certain behaviors. Understanding this automatic behavior allows us to surrender to what we cannot control. It frees us to do the next right thing by staying in the present rather than worrying about the future or being shamed and experience guilt about the past. It takes practice. Post Script: Also see this article How To Tame Your Lizard Brain by By Susan Murphy, PhD of Desert Health. While teaching a group of fourth graders, I gave them an opportunity to exercise their public speaking skills. The lesson was not on public speaking but on fresh and saltwater fish identification. As they were working in their activity book and were all engaged, I saw the opportunity for a parallel activity instead of having them just sit there quietly. I invited the students to come to the front and tell a favorite fishing story, true or fictional. Many raised their hands to participate and several did, some stories long and some just a few words such as, “My grandpa caught a shark!” A young lady by the name of Eliza raised her hand and said she had a story. When she accepted my invitation to come up front, she just stood there and stood there with a blank stare. At that moment, her lower lip started to quiver, her eyes showed a look of fear and she bolted out of the classroom. Well before I learned of God and religion, I was influenced by the God of the Boy Scouts of America, and their reference to him in that program. It was about 1965 when I started participating in Scouting, following my mom around while she did her Cub Scout activities. Maybe she was a volunteer for the neighborhood, or perhaps she was involved with my brother John. While the Boy Scouts (or Cub Scouts) do not advocate a certain way to believe in God, they certainly support the faith of believers in such a general way, that it is for the most part not offensive to any, other than someone who may have strong feelings that no higher power exists at all. 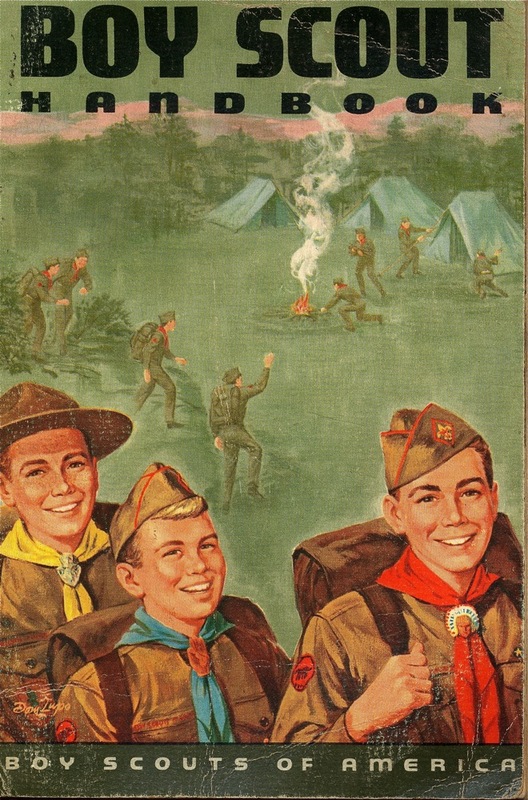 Examples can be found in the Scout Oath and Law. The Scout Oath: On my honor I will do my best to do my duty to God and my country and to obey the Scout Law; to help other people at all times; to keep myself physically strong, mentally awake, and morally straight. This song was also recorded by the well known folk singer Burl Ives, and can be found easily in music formats online. Try here. We sang this song on most major Scout outings. The last time I sang it with a large gathering of people, was when my sister Irene included it in my Dad's funeral. To this day, the words tell me to serve God by serving others and to live an honorable, healthy life. I'm grateful my parents influenced me in this direction. Home, its responsibilities, joys, sorrows, smiles, tears, hopes, and solicitudes form the chief interest of human life. When one puts business or pleasure above his home, he that moment starts on the downgrade to soul-weakness. When the club becomes more attractive to any man than his home, it is time for him to confess in bitter shame that he has failed to measure up to the supreme opportunity of his life and flunked in the final test of true manhood. The poorest shack in which love prevails over a united family is of far greater value to God and future humanity than any other riches. In such a home God can work miracles and will work miracles. Our country is being torn apart from its very roots (the family unit) upward. We see it in increased crime, mass shootings, the opioid epidemic, disdain for human life, common decency and upheaval in our schools. Please create a Task Force for the Family, which could be called The Parent Commission, to encourage mothers and fathers, grand parents and relatives to step up and raise our precious young children in American with values of kindness, generosity, and decency. This task force would be lead by clergy, major service organizations and academia to help American families to reinvigorate our youth with positive values in and from the home. This would be an investment in America, that will save the country billions of future dollars. It would reduce crime, creating honest, healthy of mind, body and spirit the youngest of our citizens, which are our most impressionable today. I would be honored to lead this committee. Please contact me for my resume and references. Flight, particularly to the stars, for centuries lay solely in the realm of man’s imagination and dreams. 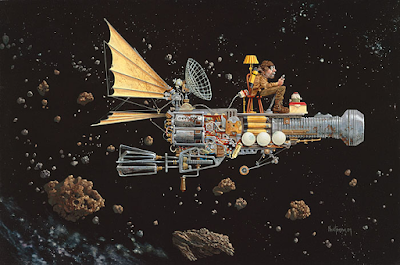 It was, therefore, not so far-fetched that NASA should turn to master fantasy artist James Christensen to contribute his vision of man in space. For Christensen, it was logical that before there was High Tech, there had to be Low Tech. There isn’t an engineer, programmer or IT specialist today that can’t identify with or see in themselves the indomitable spirit of the space age barnstormer that built the space program, designed the desktop and envisioned the cloud. Nor could they escape the feeling of having to do it all with duct tape and spare parts found in their or their parents' basement. This framed print was given to me by my old friend and boss Dr. Bruce Bugbee back in about 1990. In our lab where we built hardware for NASA plant science research, we took pride in our motto, "Not high-tech, not low-tech, but just the right amount tech!" I'll always treasure it as a most thoughtful gift, and it is hanging in my office once again. Thanks Bruce! There are certain items we possess that have more than just monetary value, and sometimes it is difficult for children to realize this. It is important however, that we teach children the difference between items have a high financial value (electronics) and items that have long-term meaningful worth (achievement certificates). For example, a third grade report card may not be of much value to a teenager, but when that teen becomes of midlife age, that once insignificant document is now precious. As a middle-aged adult, I look at the "collectibles" of my young children and my diseased parents, and realize they are not just fun to look at, but a jewel to behold. Learning the true value of items we possess is one of the life skills taught in the 4-H Youth Development program, and should be a lesson taught to our own children. Picture a scenario where a family finds out that severe weather is heading their direction, and notified to evacuate to a safe location. The family tells the children and decide they will depart in the morning, and can only take minimum supplies and valuables, because of constraints on space in the vehicle. What items will the adults pack, and what will the children’s choices be? As adults, we know to take important documentation regarding our home, finances and medical needs. However, children on the other hand may have difficultly choosing, when they learn they can only take one suitcase. It is important that we begin to teach our children to begin to organize their things and separate what is important or not. This document focuses on important papers and photographs; and how to store, organize, and prioritize them. We can support and teach our children to be prepared and give them tools to assist them. Be stored in their original (paper) and digital format, but in some cases you may wish to digitize paper documents. Be prioritized into categories such as Mundane, Important and Critical. Be kept in a safe, water resistant and portable, designated spot for retrieval and evacuation. A plastic tote box works well for this, as well as zip-top bags within the tote to subcategorize. 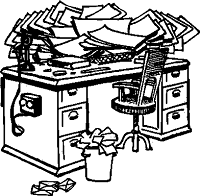 Consider the “shelf life” of a document. Birth certificates, mortgage papers and deeds should be kept for a lifetime, whereas monthly utility bill records may only need to be kept for a year. 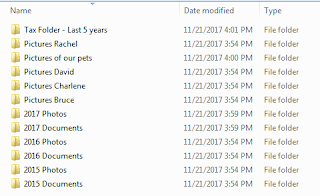 For families and individuals with more than one computer or electronic device, the Cloud can be useful as a repository. The Cloud is electronic off-site storage or an online web storage space, some of which are free and some are not. Purchase a portable back up hard drive to archive files on a regular basis. 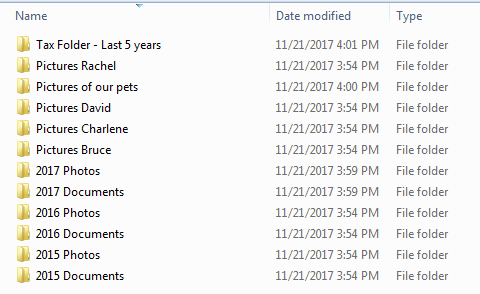 Computer hard drives, phone storage and thumb drives can be lost, stolen or damaged, causing the information to be lost forever or prompting expensive recovery services. Recording these data to a compact disc or DVD is also a good option. Consider storing critical copies with other family members or safe deposit box allowing for redundancy protection. Whether paper or digital, store documents and images sorted by the primary individual it concerns. In the short term, it is tempting and acceptable to sort the images by event, such as Family Reunion 2009, but ultimately as time goes on, individuals will want their own images or documents. Sorting single person images are easy. For example, a picture of Sally goes in a plastic tote or electronic file labeled with her name. Pictures of multiple individuals can be stored under the eldest family member in the photo. You may create your own organizing system for this purpose. Purchase or set aside a section of files or tote box for grabbing and evacuating in hurry. So if your papers, files and photos need organizing, remember – we never know when a disaster may come and we need to evacuate. Being organized and prepared will reduce stress levels, aid in recovery and preserve valuable items for long-term benefit. If we include our children in this process, they can assist with the task and start a healthy habit that they may carry into adulthood. Targeting Life Skills in 4-H, Marilyn N. Norman and Joy C. Jordan, UF/IFAS Extension Publication #4HS FS101.9, 2006. Keeping a Household Inventory and Protecting Valuable Records, Michael T. Olexa and Lauren Grant, UF/IFAS Extension Publication #DH138, 2016.